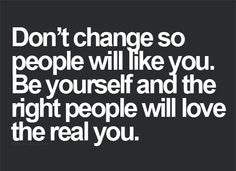 Surround yourself with the people who love you for being you. True friends love you no matter what. They love all of you. They even love your weirdness. Don't let anyone change who you are, or who YOU want to be.